This gluten-free granola with mixed nuts and coconut is crunchy and lightly sweetened with honey. Top your yogurt, ice cream or eat this granola with milk! Not too long ago I got my husband to switch from flavored yogurt to plain Greek yogurt. I felt like it was a major win and something I feel good about because he eats yogurt just about every morning, and what he was eating was loaded with sugar! Not the best way to start a day! 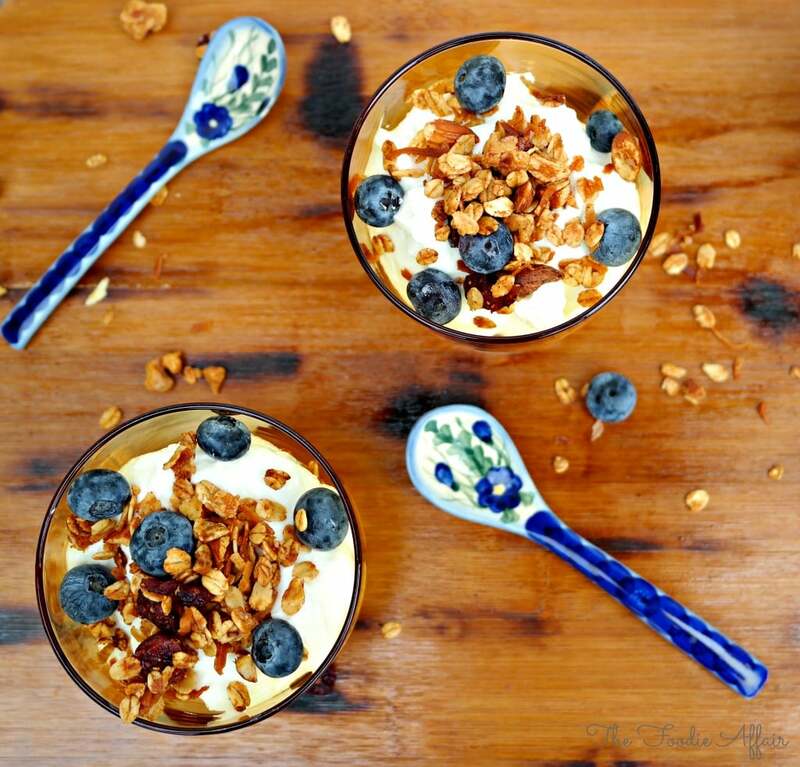 Now he adds just a small amount of sweetener to plain yogurt, and has this Granola with Mixed Nuts and Coconut for an extra satisfying and filling topping! When I switched to eating plain Greek yogurt I adjusted to the tartness by sweetening the yogurt with fresh fruits, stevia, xylitol or agave. Alan tasted several different brands, and also did a lot of ingredient comparisons before switching to a low sugar brand. It was shocking to learn that 5-7 teaspoons of sugar is packed in those small 6-8 ounce containers of yogurt! 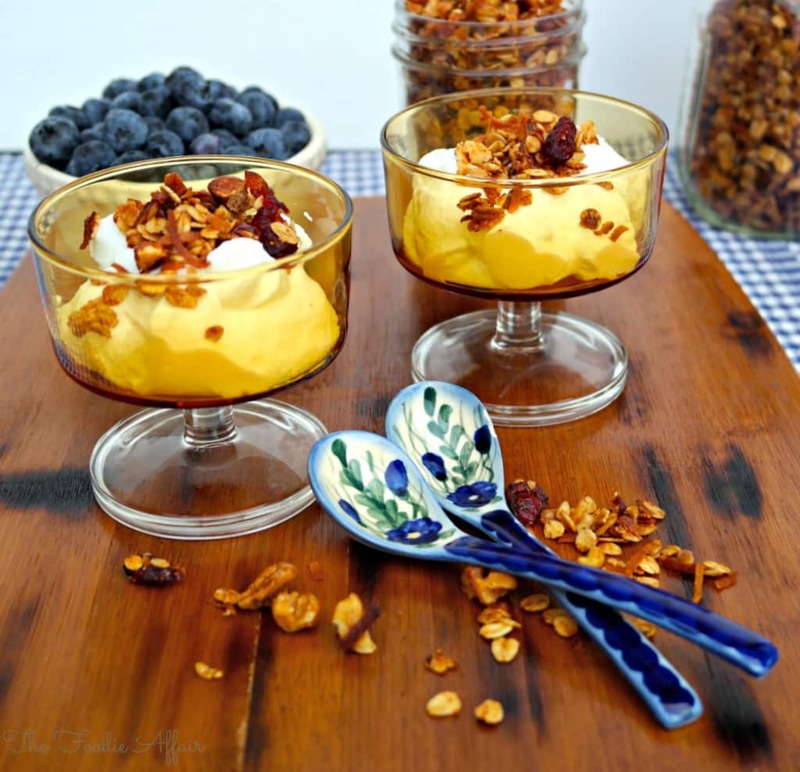 Topping your plain yogurt with this granola my be all the sweetener you need. This granola is baked with honey adding a light sweet taste, and enhanced even more with the coconut and cranberries. I used gluten-free oats, which is what I had in my pantry, but I have also made this with regular quick oats. You can toss in some fresh fruit like blueberries, add milk and eat it like a cereal or munch on it between meals for a satisfying snack! In a large bowl mix together oatmeal, nuts, coconut, cranberries, and cinnamon. In a small bowl, mix honey and coconut oil together. Toss honey mixture into the oatmeal coating all the ingredients. Put the mix on a cookie sheet covered with a silicone baking mat. Bake 25-30 minutes. Every 5 minutes take out and stir the granola then flatten to a single layer. When granola is golden, remove from oven and let cool. Store granola in an airtight container for up to 2 weeks. Are you a fan of quinoa? You also might like this Quinoa Pumpkin Seed Granola! Crunchy and delicious and perfect for those rushed back to school mornings. Schools have not started yet here, but I think I am going to try this granola to my son when he starts his school year. It looks so crunchy and delicious! I love the texture of this granola, especially when I eat it with yogurt! Enjoy this time before your son starts school! 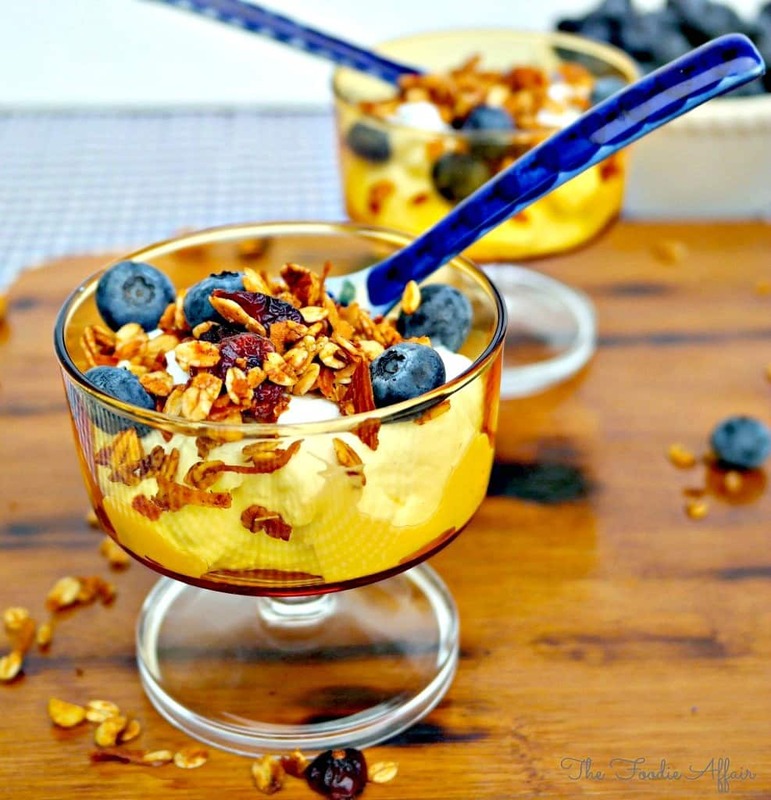 Granola is a perfect snack to munch on! Love the variety of nuts especially the macadamia in your granola. Don’t think it will last for 2 weeks in my house. I’ve noticed the granola doesn’t last that long in my house either! Thank you, Nicole! We were in Germany for a few years and they call it muesli too! G’day! How healthy does this granola look? YUM! Your granola is exactly how I like mine! Love adding coconut, dried fruit and nuts! Now I have a huge craving!!! All the textures of the ingredients in this granola makes me happy! The coconut adds just a slight touch of coconutty flavor. So good! We love granola. 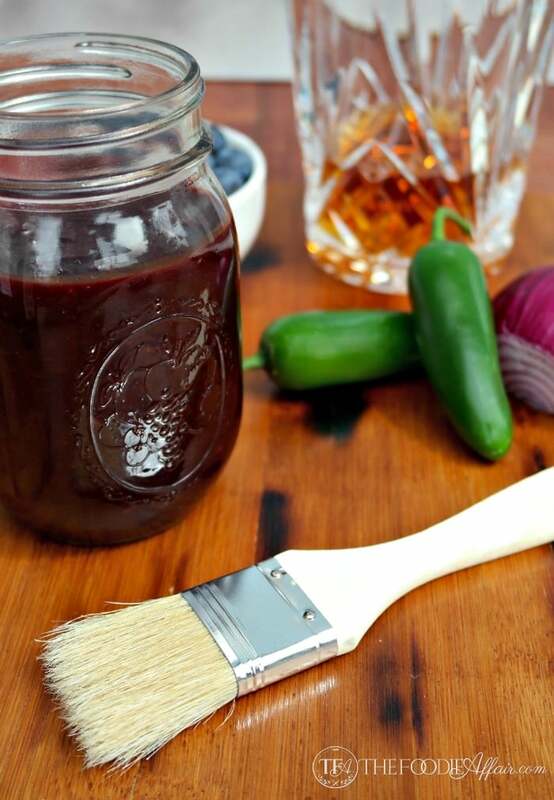 This is will be a fun recipe to make this weekend. You can easily experiment with this granola recipe. I might add some mini chocolate chips when I make my next batch. It’s crazy how much sugar is in flavoured yogurt, isn’t it? We think we are eating something healthy but the healthy part is overshawdowed. Looove homemade grandola, this looks like a delicious version! I love this recipe! 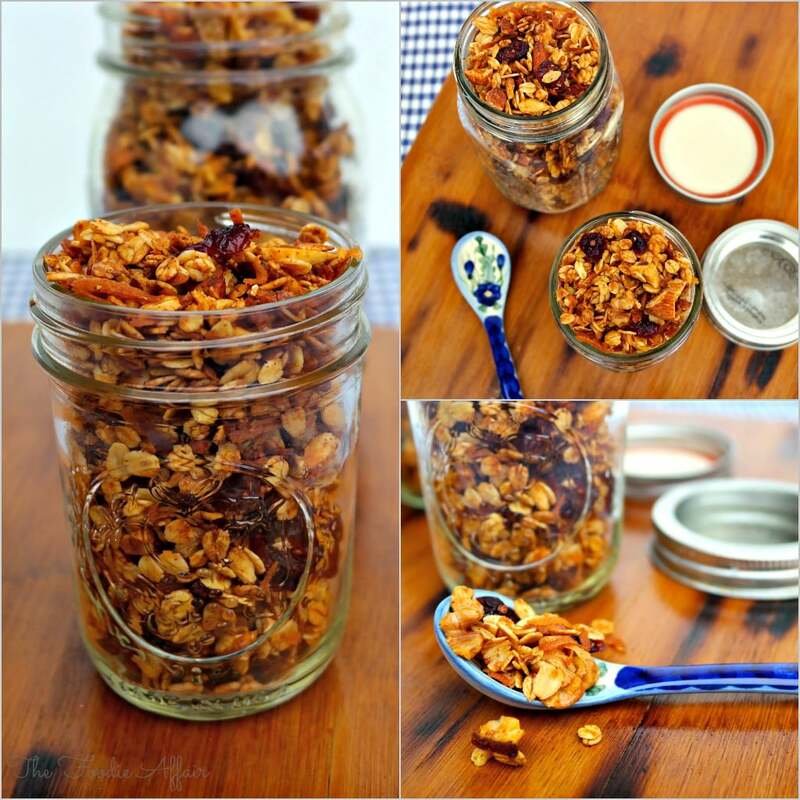 Such a fantastic idea to make Granola with mixed nuts and coconut. I can’t wait to test it out. It’s such a yummy combination, but I have to limit myself because I could really do some damage here – haha! Coconut is soul-food for me and this is a lovely idea to combine with granola and use it as topping! I used to make granola all the time. I forgot how wonderful it is. This looks so tasty. I hope this recipe inspires you make it again. I love the crunchy texture of granola. Your photos are gorgeous. You’ve reminded me it’s high time I made myself some granola again. I try not to have any sugary foods for breakfast, but I find the dried fruit is enough to sweeten mine. As for Greek yogurt, it’s hard to imagine life without it now. I wish I had some of this granola for my yogurt in the morning!! It looks sensational! It feels like a special tread when I add granola to my yogurt. It’s the perfect little bit of texture to add to yogurt! Great recipe. Coconut is definitely a bold choice, but, a good one.